Effective April 1, 2014, the Texas Alcoholic Beverage Commission (TABC) will begin collecting tax from all cruise passengers. The tax is applicable to all liquor and tobacco that enters the state of Texas via the cruise terminal. Therefore, all purchases made on the islands, as well as onboard, will be taxed upon debarkation in the cruise terminal. These duties will be in addition to whatever taxes may be imposed by US Customs. The following letter will inform guests of the importation tax that is being imposed by the State of Texas TABC. 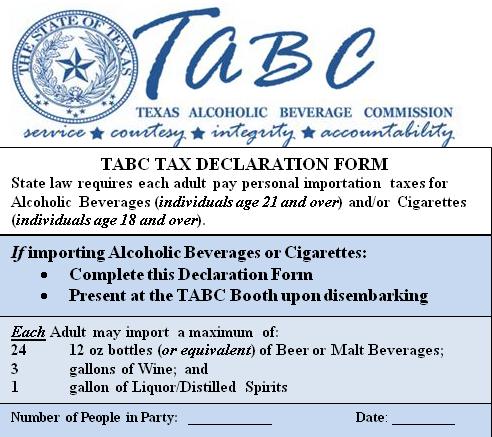 The TABC Declaration form is on the back of the letter. The letter and form will be distributed to all staterooms before embarkation commences. Guests will need to complete the form and carry it with them when they disembark. Welcome aboard the beautiful Carnival ________. We are delighted to have you sailing with us this week. Before you start making yourself at home and get busy with all the fun activities and exciting entertainment we have in store for you, we need a moment to share with you some important information. 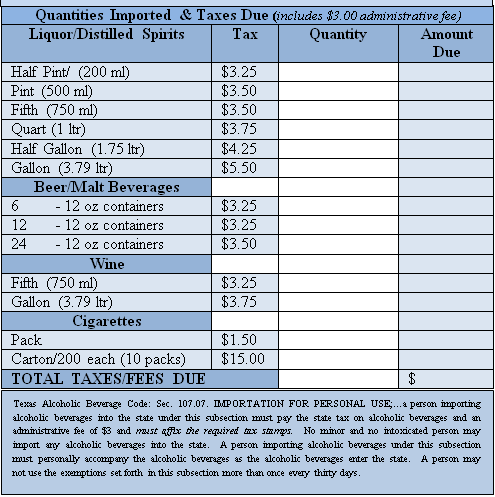 As you may know, the Texas Alcoholic Beverage Commission began collection of an importation tax on all liquor and tobacco at the port of Galveston on January 1, 2014. The tax applied to all Texas residents and non-Texas residents staying in the state for any length of time (seasonal resident). The Texas Alcoholic Beverage Commission has informed us that previously exempt passengers, those disembarking from cruise ships entering Texas will no longer be considered “in transit” to another state or country but rather will be considered “importing” or bringing alcohol and cigarettes into the state. This means the importation tax imposed in January will apply to anyone that enters the state of Texas via the cruise terminal regardless of their residency or the amount of time spent within the state effective April 1, 2014. The tax is applicable to all liquor and tobacco that enters the state of Texas via the cruise terminal. Therefore, all purchases made onboard and on the islands, will be taxed upon debarkation in the cruise terminal. These duties will be in addition to whatever taxes may be imposed by US Customs. Please complete the TABC (Texas Alcoholic Beverage Commission) Declaration Form, on the reverse of this letter and have it with you at debarkation. Now that we’ve gotten that out of the way, let the fun begin. My entire team will do everything possible to make this cruise the most fun and memorable ever!